Summary: Researchers from Salk Institute have found additional evidence that fisetin, a natural compound found in strawberries, could help to treat cognitive decline and memory loss associated with aging. They discovered the compound reduced memory loss in mouse models of Alzheimer’s disease. Based on the findings, researchers report fisetin could help prevent other age related neurodegenerative diseases. Salk scientists have found further evidence that a natural compound in strawberries reduces cognitive deficits and inflammation associated with aging in mice. The work, which appeared in the Journals of Gerontology Series A in June 2017, builds on the team’s previous research into the antioxidant fisetin, finding it could help treat age-related mental decline and conditions like Alzheimer’s or stroke. The Salk team fed the 3-month-old prematurely aging mice a daily dose of fisetin with their food for 7 months. Another group of the prematurely aging mice was fed the same food without fisetin. During the study period, mice took various activity and memory tests. The team also examined levels of specific proteins in the mice related to brain function, responses to stress and inflammation. “At 10 months, the differences between these two groups were striking,” says Maher. Mice not treated with fisetin had difficulties with all the cognitive tests as well as elevated markers of stress and inflammation. Brain cells called astrocytes and microglia, which are normally anti-inflammatory, were now driving rampant inflammation. Mice treated with fisetin, on the other hand, were not noticeably different in behavior, cognitive ability or inflammatory markers at 10 months than a group of untreated 3-month-old mice with the same condition. Additionally, the team found no evidence of acute toxicity in the fisetin-treated mice, even at high doses of the compound. Other authors included: Antonio Currais, Catherine Farrokhi and Richard Dargusch of Salk and Aaron Armando and Oswald Quehenberger of the University of California, San Diego. Funding: The work was funded by the Alzheimer’s Association, the Burns Foundation and the National Institutes of Health. Salk Institute “More Evidence That Natural Plant Compound May Reduce Aging’s Cognitive Effects.” NeuroscienceNews. NeuroscienceNews, 10 July 2017. Alzheimer’s disease (AD) is rarely addressed in the context of aging even though there is an overlap in pathology. We previously used a phenotypic screening platform based on old age–associated brain toxicities to identify the flavonol fisetin as a potential therapeutic for AD and other age-related neurodegenerative diseases. Based on earlier results with fisetin in transgenic AD mice, we hypothesized that fisetin would be effective against brain aging and cognitive dysfunction in rapidly aging senescence-accelerated prone 8 (SAMP8) mice, a model for sporadic AD and dementia. An integrative approach was used to correlate protein expression and metabolite levels in the brain with cognition. It was found that fisetin reduced cognitive deficits in old SAMP8 mice while restoring multiple markers associated with impaired synaptic function, stress, and inflammation. These results provide further evidence for the potential benefits of fisetin for the treatment of age-related neurodegenerative diseases. Fisetin (7,3′,4′-flavon-3-ol), is a plant polyphenol from the flavonoid group. It can be found in many plants, where it serves as a colouring agent. It is also found in many fruits and vegetables, such as strawberries, apples, persimmons, onions and cucumbers. Its chemical formula was first described by Austrian chemist Josef Herzig in 1891. The biological activity of fisetin has been studied in many laboratory assays; like other polyphenols it has many activities. Fisetin can be found in a wide variety of plants. It is found in Eudicotyledons, such as trees and shrubs in the family Fabaceae, such as the acacias Acacia greggii and Acacia berlandieri, the parrot tree (Butea frondosa), the honey locust (Gleditsia triacanthos), members of the family Anacardiaceae such as the Quebracho colorado and species of the genus Rhus, which contains the sumacs. Along with myricetin, fisetin provides the color of the traditional yellow dye young fustic, which was extracted from the Eurasian smoketree (Rhus cotinus). Many fruits and vegetables also contain fisetin, including strawberries apples, and grapes. Fisetin can be extracted from fruit and herbal sources in juices, wines, and infusions such as teas. It is also found in Monocotyledons such as onions. It is also present in Pinophyta species such as the yellow cypress (Callitropsis nootkatensis). Fisetin is a polyphenol, which is a flavonoid subgroup. Flavonoid synthesis begins with the phenylpropanoid pathway, in which phenylalanine, an amino acid, is transformed into 4-coumaroyl-CoA. This is the compound that enters the flavonoid biosynthesis pathway. Chalcone synthase, the first enzyme of this pathway, produces chalcone from 4-coumaroyl-CoA. All flavonoids are derived from this chalcone backbone (this family being the so-called chalconoids). The activity of different enzymes, including isomerases and hydroxylases, alter the backbone depending on the subclass of the flavonoid being produced. Transferases help control changes in the flavonoid’s solubility and reactivity by catalyzing the addition of things such as methyl groups and sugars. This allows for controlled fluctuations in physiological activities. Flavonoid biosynthesis gene regulation occurs through the interaction of different transcription factors. Depending on the combination of transcription factor interactions, the structural genes involved in flavonoid biosynthesis are expressed in specific locations of the plant and at specific times. 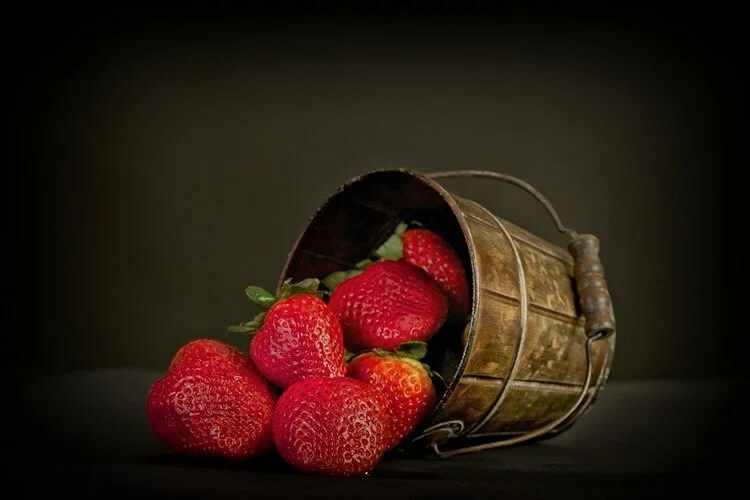 Many myeloblastosis (MYB) transcription factors have been identified in a variety of fruits and plants, including strawberries, maize, and arabidopsis, as being important in the regulation of flavonoid biosynthesis and accumulation. These transcription factors continue to be studied in plant model organisms such as maize and Arabidopsis. The environment of the plant has also been shown to affect the flavonoid biosynthesis pathway. Shorter wavelengths of light, ranging from blue to UV light, allow for higher production and accumulation of flavonoids in fruits. These wavelengths activate enzymes that are involved in the phenylpropanoid and flavonoid biosynthesis pathways, stimulating the production of flavonoids. The level of stimulation can vary between individual fruits. Fisetin, like other polyphenols such as resveratrol, is a sirtuin-activating compound and has been shown in laboratory studies to extend the life of simple organisms like yeast, worms, and flies. Like the other compounds, it has also been shown to be reactive in many different assays of biological activities, raising the possibility that any drug generated from fisetin would have too many side effects to be useful. Fisetin has shown anti-cancer activity in studies on cells and model animals conducted in laboratories, and appears to block the PI3K/AKT/mTOR pathway. In lab studies it also has been shown to be an anti-proliferative agent, interfering with the cell cycle in several ways. Fisetin, like some other flavonoids, has been found in lab studies to be a topoisomerase inhibitor, which may turn out to be a carcinogenic activity or an anti-cancer activity – further research is needed. In studies conducted on cells in a laboratory, fisetin inhibits the activity of several pro-inflammatory cytokines, including tumor necrosis factor alpha, interleukin 6, and Nuclear factor kappa B. It has also been shown in lab studies to upregulate glutathione, an endogenous antioxidant. Fisetin also has direct activity as a reducing agent, chemically reacting with reactive oxygen species to neutralize them. Based on lab studies, it appears that fisetin lodges in cell membranes and prevents oxidative damage to lipids in the cell membrane. Fisetin, like other flavonoids, has a planar structure, with multiple carbon rings. Fisetin is able to scavenge free radicals as a result of its electron donating capacity, which is due to the presence of two hydroxyl groups on one ring and a hydroxyl group on another ring. In vitro screening has identified fisetin as an antimitotic compound.